Coconut Oil is wonderful for many different uses. 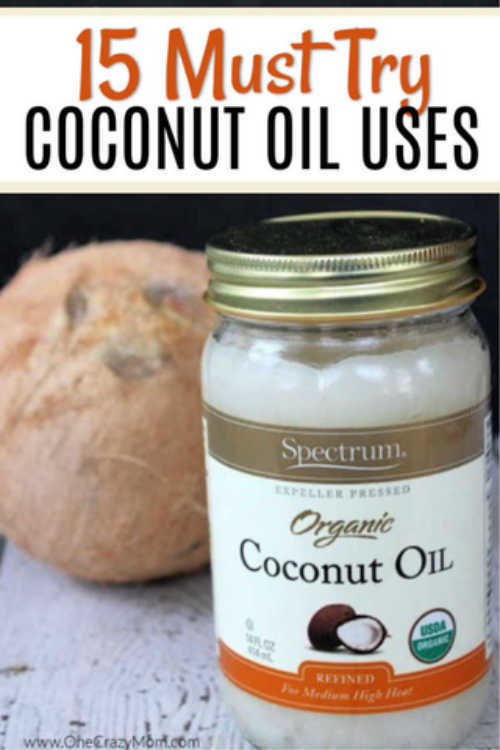 Learn about 15 Coconut Oil Uses that will help you in lots of different ways while being budget friendly. We all know that coconut is good for you… right? I mean, we hear about it all the time. From cooking and cleaning to beauty, coconut oil seem to be the magic trick. I thought it would be fun to give you some of my clever ideas on different uses for coconut oil. You may already have coconut oil on hand but I bet you don’t realize all that you can do with it! It has so many wonderful uses. It is budget friendly and works much better than all those individual products you can buy at the store. Plus, it is so nice knowing exactly what you are putting on your skin. You don’t have to wonder about harsh chemicals or words you can’t pronounce. Coconut oil does the trick and without the chemicals. That is a win for sure! After some research and some trial, here are my favorite ways to us coconut oil. What are the benefits of coconut oil on skin? Coconut oil is so beneficial for our skin and just one of the many uses for coconut oil. From moisturizing our skin to acting as impromptu Neosporin, it has so many fabulous uses. It also works as diaper rash cream and even deodorant. Truly this ingredient is so versatile and does many things. Let’s learn how to use coconut oil! You will be amazed at how much one little ingredient can do! 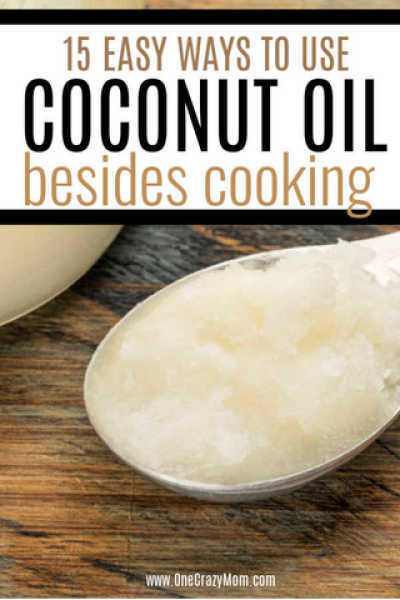 From beauty uses for coconut oil to cooking and more, it is simply wonderful! Coconut oil can serve as a pretty fine substitute for shaving cream when you’re getting ready to go to work in the morning. It is naturally thicker and has a nice moisturizing component that makes it perfect to replace your shaving cream. Also, if you rubbed the electric razor a little too hard on your skin and have skin irritation, coconut oil can also serve as a fine after- shave lotion too. Accidents happen and we are not always prepared. Thankfully, coconut oil can keep those minor scrapes from developing into worse things, like infections. Just dab a little of it over any cut, scrape, or scratch and put a Band-Aid on top of that injury will speed healing with the anti inflammatory properties. An added bonus is that it smells a lot better than anything you could pick up at the drugstore on the corner. Plus you know exactly what you are putting on that cut (no “hard to pronounce” ingredients). Now, here’s something really unique you’d never expect out of coconut oil; it can also be used as deodorant! It is an extremely effective tool that can keep those pits sweet-smelling, and if used in conjunction with baking soda, it can be even more effective. Just massage it in and you have an instant deodorant. You can also add essential oils. While some of the moisturizers we buy at stores smell pretty good, some smell like someone just scooped up some sludge from a pit in Mexico. Some of us don’t want to pay the high prices for the expensive moisturizers. Luckily, most people like the smell of coconut, the mere scent of which invokes images of Hawaiian beaches and Caribbean shores. Thankfully for you, coconut oil is a nice, natural moisturizer that you can use on anything from dry elbows to chapped lips! This is by far my favorite way to use coconut oil. You know, with the amount of products that claim to keep Athlete’s Foot at bay, you’d wonder how all of those fancy foot cream companies aren’t out of business these days. Coconut oil also works well at keeping Athlete’s Foot away. A quick massage of the stuff on your foot does the trick. Combine coconut oil and sugar for the perfect body scrub. It exfoliates the old skin and helps moisturize it at the same time. Apply regularly to the baby’s bottom to improve skin health. To be honest, this works great for all skin rashes. Coconut oil is the perfect idea to keep that leather clean and protect it. Whether you are using it on a leather jacket, leather boots, or even your leather seats in your car (Tried it!) it really does work great. Forget the WD-40, coconut oil works great to stop those squeaky hinges. Coconut oil can serve as a great way to get those tough stains and smells out of your favorite wood bowl and off your usual cutting board. Just use it as you would any other wood treating oil. Just a fine, thorough rub into the wood and your wood cutting board is fresh once again. Coconut oil is the perfect deep conditioning hair treatment. Rub a small amount of oil into hair (mostly at ends), comb through and put hair in a loose bun before bed. Wash out thoroughly in the morning. 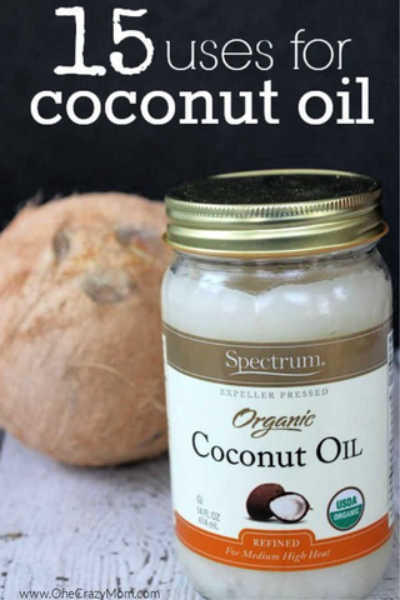 Once you know how to use coconut oil for hair, it is so easy. Yep it is true. Just toss it around in your mouth for a good 10-15 seconds in the morning to clean your mouth up a bit. When all is said and done, just rinse the leftovers out with water and spit. Skip your normal vegetable oil and use coconut oil instead. This oil cooks much better at higher heats and it has several added health benefits. Plus, if you want to jazz up your popcorn. Drizzle it over instead of butter and I think you will like that special treat! 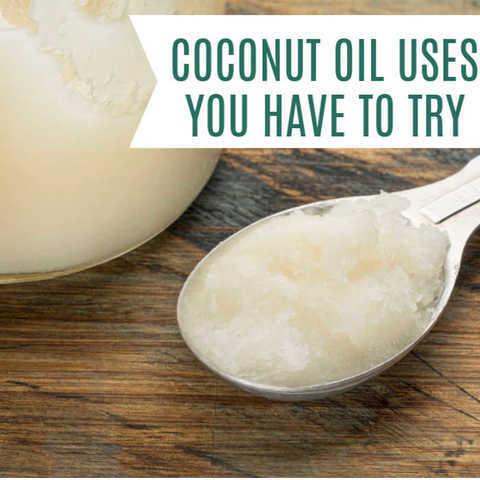 If you were wondering how to eat coconut oil, this is one of our favorite ways to do so! Energy drinks lift us up, but they eventually bring us down even lower than when we started. Sometimes a real pick me up is needed to get us through our busy lives. This is where our fine palm-tree-borne friend comes into play. Coconut oil has been proven to give men and women alike nice bursts of energy when things are getting pretty darn droopy-eyed. Several people will mix it in their tea, or their afternoon smoothie to give them an extra energy boost. Switch up all your regular baking recipes with coconut oil. From cookies and cupcakes. coconut oil will add some nice health benefits. It will also add a delicious flavor as well. Like I said, there are MANY, MANY different uses for Coconut oil, but these are my personal favorites. Now if you are interesting in trying some of these, I highly suggest purchasing your coconut oil on Amazon. Lately, they have ran the best price and you do not even have to leave your house. I know many of you use coconut oil all the time. What are your favorite liquid coconut oil uses? There are so many uses and it really is a wonderful ingredient. From cooking and beauty to coconut oil uses for dogs, this one little ingredient covers a lot of ground! The great thing about coconut oil is it has SO many uses. You can literally use this one ingredient for tons and tons of uses around the house. We love making products at home and before long, I was able to have lots of different products to use that we had made. There are several things we have made recently using coconut oil. Coconut oil is wonderful combined with shea butter. The fats in coconut oil combine to make your skin very smooth. Mineral oil and coconut oil work great on cracked heals or you can try olive oil too. Apply coconut oil and the saturated fat content will work wonders. Lip balm is another favorite to use with a bit of coconut oil. We are always on the lookout for natural remedies. The fatty acids and oil pulling have lots of useful benefits and medium chain triglycerides. Let us know how it goes for you. You will love using all these great natural products and enjoying the many uses of coconut oil. You won’t find any of that in these natural products that can very easily be made at home. Make sure you also check out our post on ways to reuse cans.